SELECTED AS A BOOK OF THE YEAR IN THE TELEGRAPH AND EVENING STANDARD '[The] centenary will prompt a raft of books on the Russian Revolution. They will be hard pushed to better this highly original, exhaustively researched and superbly constructed account.' 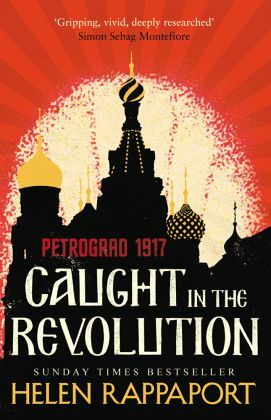 Saul David, Daily Telegraph 'A gripping, vivid, deeply researched chronicle of the Russian Revolution told through the eyes of a surprising, flamboyant cast of foreigners in Petrograd, superbly narrated by Helen Rappaport.' Simon Sebag Montefiore, author of The Romanovs Between the first revolution in February 1917 and Lenin's Bolshevik coup in October, Petrograd (the former St Petersburg) was in turmoil. Foreign visitors who filled hotels, bars and embassies were acutely aware of the chaos breaking out on their doorsteps. Among them were journalists, diplomats, businessmen, governesses and volunteer nurses. Many kept diaries and wrote letters home: from an English nurse who had already survived the sinking of the Titanic; to the black valet of the US Ambassador, far from his native Deep South; to suffragette leader Emmeline Pankhurst, who had come to Petrograd to inspect the indomitable Women's Death Battalion led by Maria Bochkareava. Drawing upon a rich trove of material and through eye-witness accounts left by foreign nationals who saw the drama unfold, Helen Rappaport takes us right up to the action - to see, feel and hear the Revolution as it happened. Helen Rappaport is an historian and Russianist with specialisms in the Victorians and revolutionary Russia. Her books include No Place for Ladies: The Untold Story of Women in the Crimean War, Ekaterinburg: The Last Days of the Romanovs, Beautiful For Ever: Madame Rachel of Bond Street - Cosmetician, Con-Artist and Blackmailer, Magnificent Obsession: Victoria, Albert and the Death that Changed the Monarchy; Four Sisters: The Lost Lives of the Romanov Grand Duchesses and Caught in the Revolution: Petrograd, 1917. A fluent Russian speaker, she has translated many classic Russian plays (including all of Chekhov's) and was historical consultant to Tom Stoppard's National Theatre trilogy The Coast of Utopia (2002). She is also a frequent contributor to television and radio documentaries, most recently Russia's Lost Princesses (BBC2, 2014). She lives in West Dorset. "A gripping, vivid, deeply researched chronicle of the Russian Revolution told through the eyes of a surprising, flamboyant cast of foreigners in Petrograd, superbly narrated by Helen Rappaport."